This was a huge hype book when it came out, so I was excited to (finally) pick up a copy and read it. I enjoy Edgar Allan Poe’s short story that this is loosely based upon and was interested to see what sort of world Griffin would create around that idea — especially one that would hold up for an entire novel and its sequel. 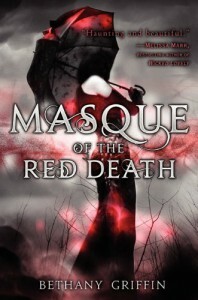 Masque of the Red Death is basically a post-apocalyptic dystopia rather loosely set in Victorian times, with some steampunk elements to it; for example, Araby and her friend April ride in steam-powered carriages, created because horses died from the plague that killed off most of the population in the city. While Poe’s short story focused on the Prince Prospero’s parties and how he locked everyone up to escape the plague, this story mostly focuses on outside Prince Prospero’s castle and what’s happening while he hides from the city’s problems. We get to briefly meet him and hear about him because April is his niece and Araby is the daughter of the scientist who invented a mask filtration system that allows the rich to go outside and survive. Overall, I found this a quick, fun read. I was worried we were going to get into mushy romance territory at the beginning, but Araby’s romantic inclinations are actually well handled and further the tension and plot of the novel, which I very much appreciated. The characters are great — we get the superficial stuff at the beginning, but then things are revealed throughout the story to slowly reveal complex, interesting characters. Though this is kind of true for the main character, this is mostly true for the side characters and reflects Araby’s knowledge/impressions of them; for example, she thinks her mom is vapid and too nervous, but then we find out that there might be a good reason for that. While this was a fast read for me, a lot of it didn’t feel particularly interesting. I think a bit too much time was set up on fleshing out just how depressing life and the city is post-plague, and while it’s important, I’m not sure that we needed to so much of the fluff and could have gone into more interesting developments. Although, I do understand that we learn along with Araby because she’s been fairly sheltered up to where we meet her in the book, I just felt like there wasn’t quite enough substance to hang onto, and what substance I was given was super interesting, so I wish there were more. Again, I found this book fairly entertaining, but didn’t see much in it to be able to rave about it. It’s a solid story with fairly interesting characters, even if the main character is a bit too naive for my liking. It falls into the same basic tropes most young adult novels of this time did: love triangle, corrupt government, and rebelling factions. I’m still interested to see how the sequel brings some of the bits and pieces together, but this isn’t something I’m going to go out of my way to recommend to people. It’s fine if you like this sort of thing, and certainly enjoyable, but not a must-read.